The Bridgeport Modern Reception Desk welcomes your valued clients with its exceptional appeal and design. This inviting and sophisticated contemporary reception desk is not only exquisitely crafted, but is also ergonomically designed to establish a win-win relationship for both employees and customers or clients alike. Enhance your company’s ambiance and professional attraction, to its greatest potential, right when stepping into the front entrance with the presentation of a Bridgeport Modern Reception Desk! Let’s just be honest, not every business lands in the perfect office space. Some business people are struggling to make functional a work space that was perhaps designed for another purpose than the one it is handling currently. This can cause a number of issues in terms of ergonomics and proper design. Edeskco.com has worked hard to find and create modern office furniture that can help to accommodate any size or shape of office space you may find yourself working in. 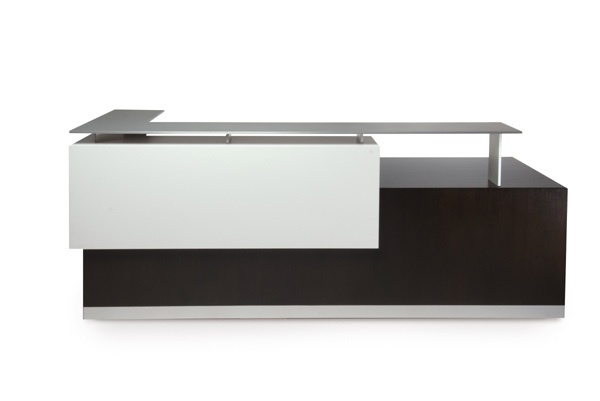 For example the Wichita Contemporary Reception desk is designed to function in even an odd shaped room. It’s unique corner design allows flexibility when laying out your reception area. With foresight and thought you can make even the most dysfunctional reception are feel warm and welcoming. You don’t even have to compromise on practicality when you make use of the smart lay out of this attractive reception desk. Edesekco.com works hard to bring a wide selection of attractive and well planned modern office furniture pieces. Besides the initial design they work hard to make each individual piece to fit perfectly in the space it is being ordered for. This is done by offering a wide variety of finishes from real wood veneers to glossy lacquers. 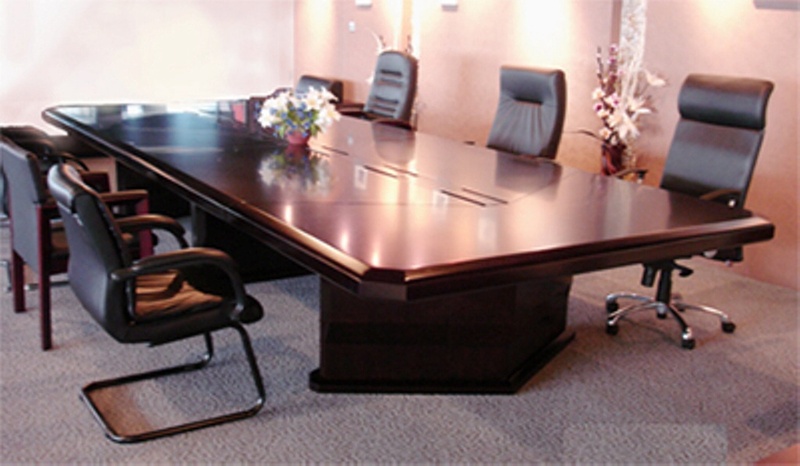 You will also find that the knowledgeable staff is happy to work with you in designing your office furniture to fit perfectly in your unique space. Small adjustment son size and shape can allow for a better fit in your reception area, conference room, or executive office. An odd shaped room, or a re-purposed office is no reason not have modern office furniture that fits in perfectly with the style of your business. Modern, sleek and attractive can fit into any space when you let Edeskco.com help you co-create office furniture that will make a great first and lasting impression on every client that walks through your doors. A tastefully designed office space can achieve some of the quickest results in impressing your clientele. In theory, ‘judging a book by it’s cover’ is foolish but in real life contrary to this theory, the book is judged by its outward appearance. Your business will often be dismissed or considered quickly based on nothing more but its outward presentation. That is why careful thought should be given to tasteful design within the office. Of special importance is the reception area which your clients will view first. In regards to the optimal reception desk consider the Bridgeport Reception Desk. This modern receptionist desk is designed to give your reception area a modern urban feel that is brimming with good taste as well as practical use of your space. With the flexibility of this custom ordered desk you will find that productivity of your reception area is improved as well as the aesthetics of the space. You can take the Bridgeport Reception desk and truly make it your own with a wide selection of real wood veneers and glossy bright lacquers. Edeskco.com can also work with you to make the desk fit in your space with alterations to the size and layout. This allows you to make a desk that is uniques and perfect your office. Edeskco.com is committed to helping business people co -create their own office spaces to fit their individual needs as well as taste. Find out how you can develop a beautiful receptionist desk that will keep your front office dressed to impress. Despite how often we hear the old verbage “Don’t judge a book by its cover” the truth is most people often and usually do. Because of this human tendency it is practical and beneficial to give some thought to the way we present ourselves in business. Just as a professional is likely to be taken more seriously dressed appropriately in business attire, so your office will be more quickly respected if it makes a statement at first sight. You can make sure this happens each and every time a client opens your front door by the simple placement of a well designed receptionist desk. 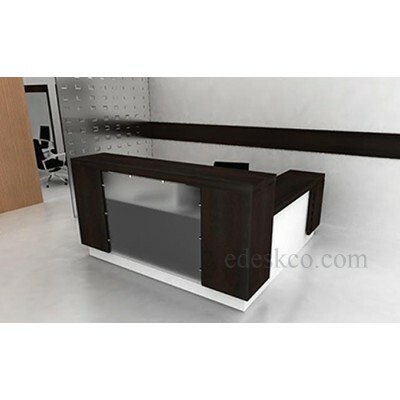 Edeskco.com offers a posh and respectable line of reception desks that will liven up the entrance to your business in a snap. As part of the incredible design options offered through Edeskco.com, customization gives you the personal edge you need to claim each piece of modern office furniture as your very own. With a wide selection of brilliant glossy lacquers and shiny real wood veneers to choose from you can nail down exactly the look that you want to represent your business and business style. If you have specific size restrictions in your office spaces Edeskco.com can help with this too by working to create desks and other pieces of office furniture that are made specifically for your spaces. One example of beautiful design in reception desks is the Kansas City modern reception desk. his Industrial styled desk is versatile and stunning to look at. Create more than just a comfortable entrance to your business. Make an impression that will override the human tendency to “judge a book by its cover” and impress with the level of professionalism that you offer through our business. The New Year is ushered in with fresh hopes and big plans. 2012 is certain to bring with it new ideas and fresh design in office interiors. Modern office style is projected to lean towards the modern sleek styles of 2011 with a faint leaning towards the traditional. A classic modern reception desk that combines modern and classic is the Glendale reception desk. This modern reception desk offers traditional wood grain textures combined with frosted glass and industrial details. This stunning work of art will make a sophisticated statement in your reception area. 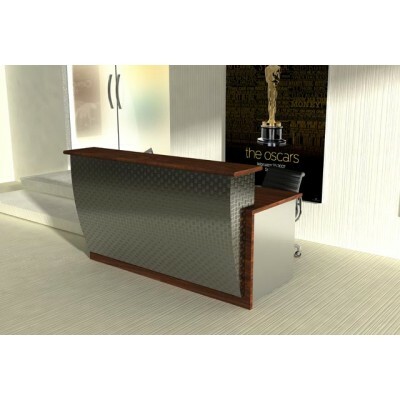 Utilizing the flexibility that Edeskco.com offers in selecting and customizing office furniture, you can make the Glendale modern reception desk to your own specifications. Customize the size and colors so that it compliments your office size and design. Bring your reception area into 2012 with a well planned, ergonomic and beautiful modern reception desk. The knowledgeable staff at Edeskco.com will assure that you are satisfied completely with the desk that you choose and that it is made just as you specify. Usher in your new year with modern office furniture that keeps your business modern and tasteful for the new years to come.